This is a USSSA state-qualifying tournament. There are two levels of play in each age group: AA and AAA/Major divisions. Pool play into elimination play. Teams are guaranteed 3 games. March 29 by 4:30pm. Limited enrollment. This tournament tends to fill prior to entry deadline. $300 per team if you register by March 8. Beginning March 9, fee is $350 per team. A $50 cancellation fee is assessed after March 29. This is a USSSA state-qualifying tournament. If enough teams register, there will be three levels of play within each age group: A, AA, and AAA/Major divisions. Format: Pool play into elimination play. Teams are guaranteed 3 games. April 19 by 4:30pm. Limited enrollment. This tournament tends to fill prior to entry deadline. USSSA age cutoff is May 1, 2019. (Example: A player 10 and under may not turn 11 before May 1, 2019). Teams must be sanctioned with USSSA. To register, call 816-587-4545, or visit www.kcsports.org. There will be two levels of play. July 8 by 4:30pm. Limited enrollment. This tournament tends to fill prior to entry deadline. *Fee: $200 per team if you register by June15. Beginning June 16, fee is $250 per team. A $50 cancellation fee is assessed after July 8.
each age group: A, AA and AAA/Major divisions. Format: Pool play into elimination play. Teams are guaranteed 3 games. No Friday games. Sept. 6 by 4:30pm. Limited enrollment. This tournament tends to fill prior to entry deadline. $200 per team for 8U teams, $300 per team for 9-14U teams if you register by August 16. Beginning August 17, fee is $250/$350 per team. A $50 cancellation fee is assessed after September 6. Teams must be USSSA sanctioned to play in this tournament. Visit www.usssa.com. 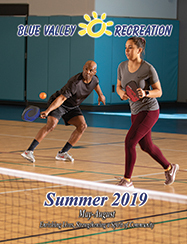 Register at www.bluevalleyrec.org under Online Registration or call 913.685.6030. Payment is required at the time of registration. The USSSA age cut-off is May 1. Participants must play in their designated age group. Admission fee for spectators/fans is $5/day for adults; children 17 and under are free (USSSA State Tournament has a different fee). Passes are issued to 3 coaches per team. No bottled/canned beverages or food may be brought into the complex. Teams can bring in team and individual water coolers. Individual trophies for 1st and 2nd place.